There’s been something bugging me about Brendon Nelson for a long time now, beyond his imbecilic listening tour and general ineptness, that I just haven’t been able to put my finger on. But a comment at grods helped to put everything in its place, it’s about evil. Almost 20 years ago Twin Peaks, a disarming and fantastic look at the hidden side of a small town, bought us into the life of the Palmer family as they are dealing with the murder of their daughter Laura. The story focuses often on the place of evil in our lives and the climax to the mystery of who killed Laura Palmer is the revelation that her father, inhabited by a malevolent spirit since childhood, was in fact responsible for the murder, along with other brutalisation during her life. Leland Palmer’s veneer of respectability is torn away as Bob, the inhabiting spirit, admits to the crimes and then drives him on a manic surge of self harm culminating in his death. By now, no doubt, most of you are wondering what a cult TV show from 1990 has to do with the Liberal party in 2008. As I said I hadn’t been able to put my finger on it, but something has always bugged me about Brendan, I think it’s the hair. Separated at birth shots of the year! Though I never watched the show, it’s impossible to argue with your logic! The true question is: have any of you seen Bob and john Howard in the same room? Howard took the blame for the election, but now he is back and telling Nelson that he should not run from the legacy, in effect calling him weak and adding pressure to his demise. Oh I think the convoluted plot-lines of “Twin Peaks” with it’s backward talking midgets and pancake munching protagonist is a lot easier to follow than the apparent randomness of conservative “logic”. Oh, wasn’t the theme to that show a song called “falling” by an artist named Julie Cruze? 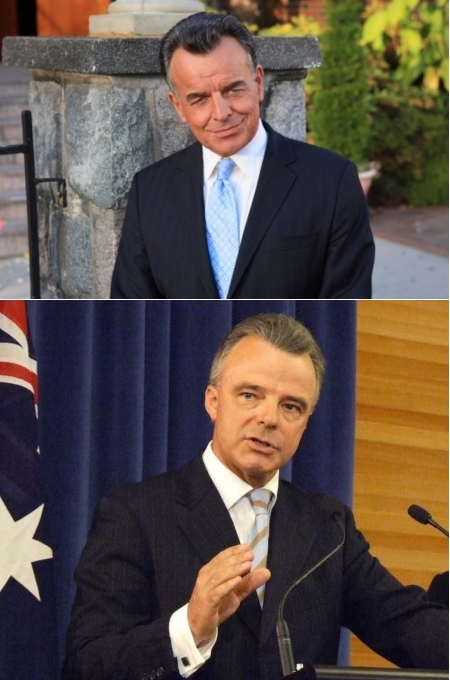 I think so, it could equally be the theme to Brendan Nelson’s popularity rating I would conjecture. Thanks for that, Dave. Although, to be honest, I was referring more to Howard and Ruddock (and then Andrews with the Sudanese) in terms of evil. By the way, who is the guy in the picture above Nelson? Is he Nelson after Bob corrupts him?